Today was the annual yard sale for the Hosanna Church, right up the road. The majority of the churches around here discontinued their annual yard sales after Katrina (not sure why), but this one continues. They obviously have a generous membership, who donate a large assortment of household items, books, crafts, toys, accessories, etc. I always find items of interest here and came prepared with three of my shopping bags to load up. 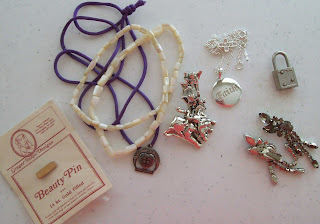 -- Small assortment of jewelry for the found items box ... (except for the elephants; they are for my sister who collects them). -- A large assortment of sewing related items. 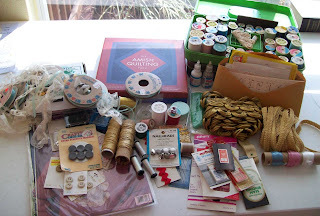 Ribbon, lace, two boxes of threads, needles, buttons, transfers, fabric paints, Amish Quilt kit, magnets, closures and a flower press for the microwave. -- (Not shown), Two full boxes of sewing patterns. I'm happy to have the return of yard sale season. Although I'm well past the point of needing any more supplies, I find it great fun going out. Thanks for the tip on Pine Island rookery. I'm seriously thinking about giving that a shot this year. The Library is cleaning out the Craft Closet and we have a lot of stuff. Help us and celebrate March’s Craft Month by making something. Stop by and see what you can make with scraps, odds, ends and lots of popsicle sticks. Who knows what you might find that will inspire you and what work of art you might create? You are welcome to bring your own “stuff” too. We will provide scissors, glue, markers, crayons, and lots of embellishments. All ages are welcome- preschoolers, older children, teens and adults too. For more information, contact Tanya DiMaggio, Children’s Services Coordinator at 985-893-6280 ext. 5. Craft-O-Rama will be held at Mandeville Branch on Saturday, March 13, between 1:00 and 4:00; Covington Branch on Saturday, March 20, between 1:00 and 4:00; Causeway Branch on Wednesday, March 24, between 2:30 and 5:30; and Slidell Branch on Wednesday, March 31, between 1:00-4:00. Children ages 9 and under may not be left unattended at any St. Tammany Parish Library. Great finds here. And I loved going on your cruise with you! Thank you for sharing those photos of a far-away land! I see you had a pretty good haul. Over here, it's mostly electronics, toys, books or clothing at these kind of sale.